According to the Book of Leinster, Colman, son of Lenin, was a descendant of Mogh Nuadha, King of Munster in 116AD. The year of his birth, which has not been ascertained exactly, is believed to have been 522AD. Colman, brought up in heathenism, adopted the profession of bard. He became attached to the court of the King of Cashel and the range of his duties may be inferred from an ancient description of the order generally. Bards were historians as well as poets; their duty was to record the deeds of the kings, chieftains and heroes; to register the genealogies and privileges of noble families, together with the bounds and limits of their lands and territories. He was engaged in these activities until about the forty-eighth year of his life. In 570AD, a dispute as to the succession to the throne of Cashel took place between two relatives, Aodh-dubh and Aodh-caomh, and a meeting was arranged between the rival candidates at which Saint Brendan of Clonfert and the son of Lenin, were present. Through their influence a compromise was effected by which Aodh-caomh was acknowledged as king. He was first Christian king of Cashel. It was at this time that the Shrine of Ailbe of Emly, which had been stolen, was discovered. Amongst those who found it was the son of Lenin, and he, at the behest of St. Brendan, became a Christian whereupon he changed his name to Colman (a name that corresponds to Colum, the equivalent of the Latin columbus, a dove) and who afterwards became a famous bishop. Many places in the counties of Cork and Limerick are linked with the name of Colman, but his earliest settlement appears to have been Cluain Uamha. It is said that the ruins of St. Colman’s ancient oratory known as Colman’s Chapel, were still to be seen at the beginning of the last century. This small oblong building, situated in the grounds of Cloyne Cathedral and known as the Fire House, was, according to tradition, the repository of St. Colman’s relics. Another tradition is that the Fire House was used for maintaining a Sacred Fire such as had been maintained by the nuns of St. Brigid in Kildare’s Holy Shrine. Magraiden, who died in 1405, relates in his life of St. Brendan that “this Colman, son of Lenin, was distinguished amongst the saints by his life and learning. 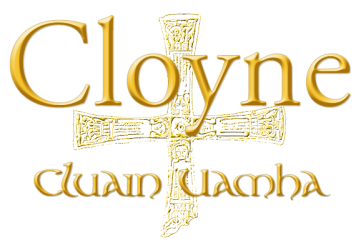 He was a founder of the Church of Cloyne, a celebrated Cathedral in Munster”. 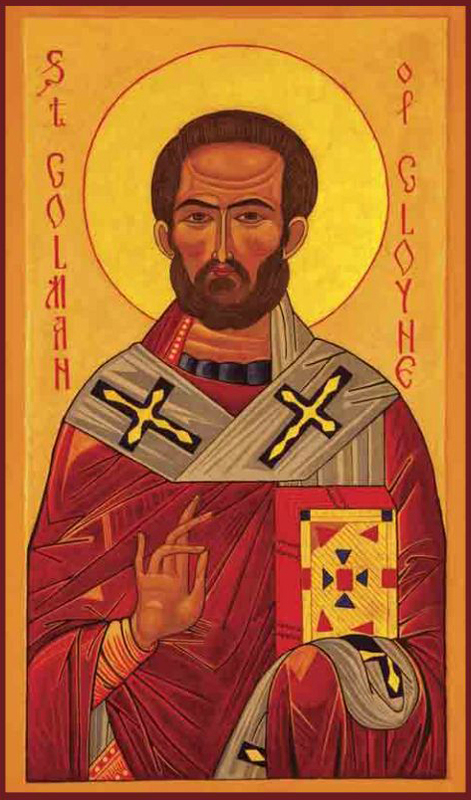 According to some historians St. Colman died in 601AD. There is also in the vicinity of the town a holy well dedicated to St. Colman. It is in the townland of Kilva, but it is no longer frequented as a place of pilgrimage. This cat had recently been spayed when found and could have traveled. Someone must be missing her. Please help us find her owners! We would like to wish all our followers, supporters and sponsors a happy and peaceful Christmas. The CDCC is made up of 26 elected members under the auspices of Muintir Na Tire with an active role in the development and promotion of the educational, cultural, economic and welfare of the whole local community. 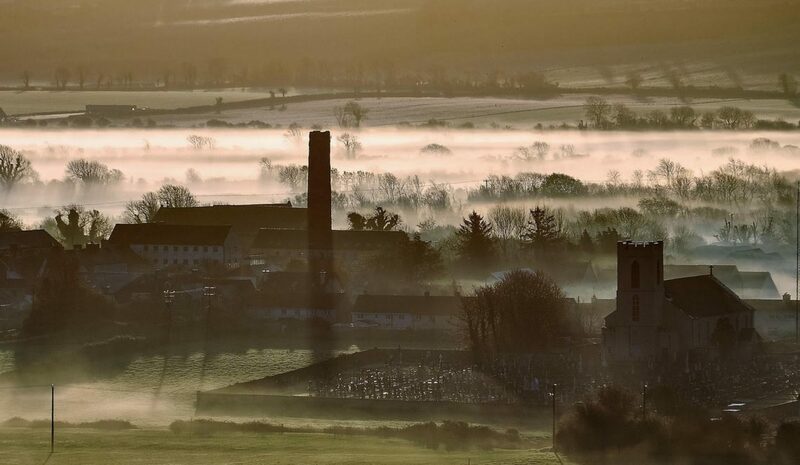 Cloyne in the mist and sunset at Hill tower by Jim O'Neill. Cloyne Cathedral and graveyard by Alek Kisielewicz. Cloyne Cathedral interior by Cerin O'Mahony. Aerial shots of Cathedral / Round Tower and Cloyne fields by Leszek Wysocki. Cave photos by Pat O'Connor. Street level shot of the Round Tower by Aisling Walker. The shot of Church St on the Cluain Uamha page was retrieved from a 1959 postcard found by Peter O'Shea.